5つ星のうち5.0This is by far the best season of In Treatment for one reason: Mia Washikowska, who plays "Sophie." Wow. What a stunning outing. This is an incredibly daring show. So simple yet so complex. Most of the episodes play out as two-handers. Admittedly, it could work as a series of one-act plays. It's just a therapist talking to his patients. There is a very high level of writing and acting going on here. Now, people will find themselves drawn to different character's stories and it can be a bit of a mixed bag because of that. But, there's so much material here, it's hard to knock it. Gabriel Byrne is really great in his role. He's convincing in his role as a therapist. And, what's more, he seems like a good one (foibles aside). This is by far the best season of In Treatment for one reason: Mia Washikowska, who plays "Sophie." Wow. What a stunning outing for a 13(ish) year old. There is a particular episode, the close of her arc, which utterly destroyed me. I'd made the mistake of watching the episode while waiting for a haircut and had to retreat to my car to bawl sans judgement. Her nuance, her honesty, her control are all way way way beyond her years. I always looked forward to her sessions during the series. All in all, it's a good series. You have to appreciate the daring of the format and grab bag of human stories. The treatment of the therapy process is accurate. As occurs in the real world, everyone -- including the therapists themselves -- questions the value of therapy. By the end of the season, it is not clear that any of the protagonists have experienced happier or more fulfilling lives as a consequence of the therapy they experience. The drive to be honest and to let it all hang out is gut wrenching, and as the show illustrates, can yield tragic consequences. Sometimes it is better not to venture into the deep, dark recesses of the mind and heart. On the other hand, there are aha! moments when the patient's experience breakthrough insights that enable them to understand better why they feel and behave the way they do. The acting is first rate. Each of the five patients the doctor is treating is credible and, by the end of the season, worthy of our sympathy. Given that the nearly forty episodes of the show take place in the a therapist's office, it is amazing how the excellent script and fine acting keep us riveted to the drama as it unfolds. 5つ星のうち5.0"In Treatment." — Rich Treat for a Mature Audience. Actors, writers, multi award winner. Authentic depiction of how a good therapist works and the toll his work takes on him and his life. A therapist is a human being who has taken years to develop his/her skills and to learn the meaning of confidentiality and client centered orientation. Being human, Dr. Paul Weston wrestles with his own role as a person whom troubled people come to have their problems "fixed." He must help the patient understand that he can't fix anything. They must confront their own demons and make hard decisions as he gently and wisely gives them guidance. There must be a separation — a line that must not be crossed — between therapist and patient. Paul comes close to that line and briefly crosses it with a patient. We eavesdroppers come — as a result of great acting — to feel his emotions and his struggle to put this aside and think of what his patient's need, even as his own private life faces a crisis. My primary career was as a physicist. Concurrent with my work in physics, I earned an advanced degree in counseling psychology. I practiced counseling for 10 years. During my training, I had a few chances to sit behind a one-way window and observe a session. From playing the role of eavesdropper (viewer) to this process, I was able to observe other therapists working with diverse patients. I found that not all therapists have the same ways of approaching their clients. This is where the therapist's own background comes into play. "In Treatment" shows how one very skilled therapist has to face his own demons to be as helpful as possible. for his patients. 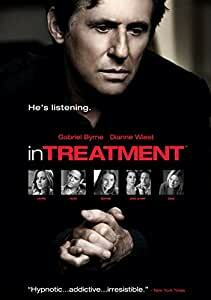 I wish I could have seen "In Treatment" years ago. It provides the one-way window that I had so few during my own training. If you are interested in watching a skillfully portrayed therapist through the one-way window that this HBO series provides, go for it. There are only a few top notch series available in reruns and this one deserves a place at the top. I highly recommend it. Bob Ralston — Author of "God, Physics, And Me." I was interested in the subject matter. This show is well done, and and began with great potential. I just became less interested when they went down the rabbit hole regarding the main character-intelligent psychiatrist falling head over heals in love with a long term patient, a lady known to him to be emotionally crippled, devious and sick... he then wrecks his own home life over this nonsensical fantasy. Blech! I expected more Intelligent behavior. Tired of shows that dumb-down to cheap-thrills when the potential for so much more is right there. Btw, am a Big fan of Gabriel Byrnes, just didn't like where this series was going. 5つ星のうち5.0A terrific start with high quality drama. As a certified therapist, a physician and a psychologist, I was curious to see how the writers were going to handle the subject. I was very impressed with the verisimilitude displayed by both the writers and the actors. Yes, Virginia, there is a therapeutic relationship just like the one shown here. Of course, a real practice has more than 5 patients and a whole lot less drama each week but otherwise it's an accurate picture. That's the good news. The bad news is that this excellent writing and acting seem to take a progressively steeper decline as the seasons progress. 5 stars for season 1, 3-4 for season two, and 1 for season 3. I'd suggest you stop watching after the first season. this intelligent and competent therapist turns into a real jerk who listens less and talks more as the show goes on. By season 3, You will find your self throwing things at the TV.